Bahiamar Hotel, Salvador, Brazil details from BrazilBookers.com. 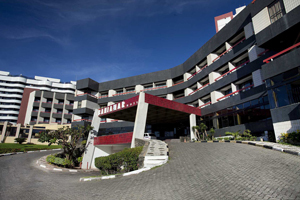 Bahiamar Hotel at Salvador is the ideal place whether you are a business traveler or a pleasure seeker. Bahiamar has all that you need to make the stay memorable. The hospitality and the services make one want to come back all over again. The 128 rooms - not one misses a balcony! Each room is air-conditioned and is equipped with a color television, radio, direct dial telephone, mini-bar, safes and a 24 hour room service. The hotel has an attached international cuisine restaurant, coffee shop, sauna swimming pool and a well furnished and modern convention center that will cater to all needs. The Bahiamar hotel in Salvador is for those who are of an active bent of mind, and wish to combine exploration with relaxation. There are so many tourist spots that you would love to visit, including the famed beaches of Brazil. It might please you to know that many sightseeing locations can be reached on foot. As for other areas, public transportation is easily accessible. So where exactly is the Bahiamar hotel? It is next to Bahia’s Convention Center, in Praia do Jardim de Alah. 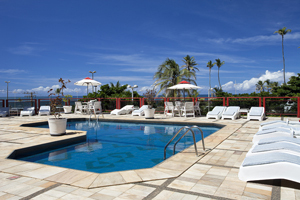 In simpler language, this hotel is located in the central region of Salvador, surrounded by shopping centers, restaurants, and other tourist attractions, such as the Flying Club Square Show. And you need have no worries about reaching this place; the hotel offers a transfer service to and from the International Airport. Hotel Bahiamar is a low-rise, but modern building that has 128 rooms. The rooms are marvelously decorated, and very comfortable. Like most luxury hotels, this one also offers air-conditioned and non-smoking rooms with a terrace/balcony. Other amenities within the room include a private bathroom with bath/hot tub, hair dryer, satellite/cable television, high-speed Internet, audio-visual facilities, refrigerator, safe deposit box, laundry service and room service. The receptionists at the desk offer a 24-hour service too. You may reach your room via the lift or the elevator. In case you have brought along your own transport, there is private parking space available. Since the objective of your holiday is to relax as much as possible, try out the massage services on offer, or swim the length of the outdoor swimming pool. The health and fitness equipment at the gym and a subsequent sauna should ensure that your weight remains under control, for you will be satisfying your palate with delicious regional and International cuisine at the Marlin restaurant. Expert chefs conjure up magic through salads and grilled meals prepared in a structure by the swimming pool. And of course, the bar/lounge is part and parcel of every hotel in Brazil. Okay, now for some sightseeing. This is one of the few hotels that facilitate currency exchange for those who require it. So fill your pockets and set out on your tour. Visit the sun-kissed beaches in Salvador if you just want to relax; and there are many of them. The historic district of Pelourinho is just a little more than 6 km away. Other attractions are the White Palace and the Government House, Basilic Cathedral, Castro Alves Square, Costa Azul Park and Rio Vermelho. And they are all within 3 to 6 km range of your hotel. Popular night spots offer excitement at night. You are bound to return with great memories of your trip! When would you like to stay at Bahiamar Hotel ? 1) Rates at the Bahiamar Hotel may not be valid during Carnival, New Years, Easter and other special dates. © Copyright Bookers International, LLC. All Rights Reserved – Information on Bahiamar Hotel, Salvador, Brazil details from BrazilBookers.com.